Magswitch Technology, Lafayette, CO, a manufacturer of switchable magnets, has introduced a new way to align and level steel plates via the Mag Press with its 1,100 lb. of hold force. Remove highs and lows with ease by placing the magnet on low, prying on high and welding with the other hand. 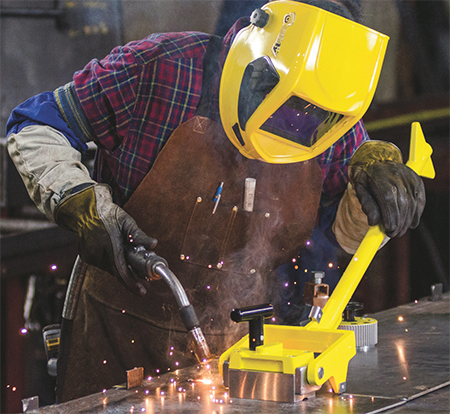 This method allows a user to align two sheets and weld the separate sheets 100 times faster than employing dogs and wedges, according to company officials. By rotating the unit’s lever to the other side, the Mag Press becomes a beam-press tool that can press 4-6-in. beams in seconds. No more pounding, breaking, grinding or clamping to remove air gaps—just turn the magnet on and push down on the lever to eliminate gaps.